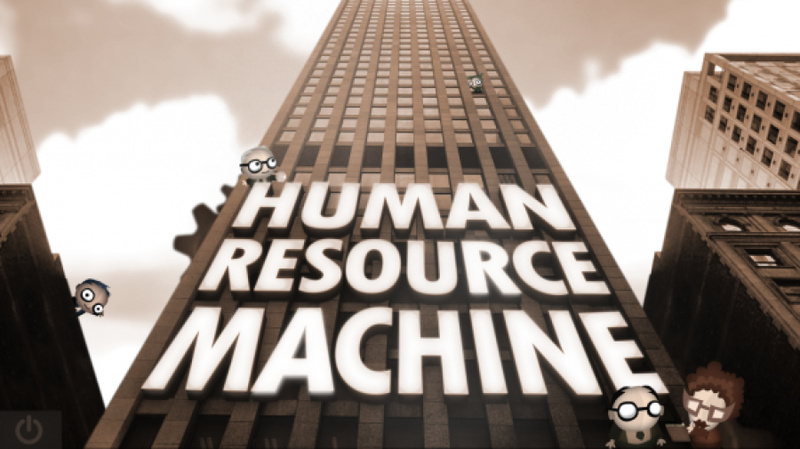 "A puzzle game for nerds"
Tomorrow Corporation - a studio set up by former members of World of Goo developer 2D Boy - has ended its relatively lengthy spell away from the spotlight to announce its next game - Human Resource Machine. Eager Wii U eShop gamers may remember its release that greeted the console launch - Little Inferno - which was a peculiar and clever puzzle game in which you simply burned objects in a fire. It makes sense when you play it. Human Resource Machine is a puzzle game for nerds. Use your little workers to solve each level's puzzle, and get promoted up to the next floor. Repeat. Each level is one year. Self improvement tip: Our previous games have all taken 2-3 years to build so far. This one took only 9 months – as much time as it takes to build a new human – and it's felt exciting and liberating the whole time. We hope you have as much fun with it as we have! No platforms have been announced yet, though details and footage are promised in the coming days. Are you a fan of World of Goo or the studio's own Little Inferno; are you keen for this developer to return to the Wii U eShop? Let us know. Loved World of Goo but didn't even realize they did Little Inferno. Defintily keeping an eye on this. I loved World of Goo, but wasn't such a big fan of Little Inferno. I'll eagerly await the release of this though. Sounds very promising. Please bring to the Wii U. Yes!! I love the stuff these guys do! Bring it! It's funny to read that Little Inferno "makes sense when you play it", because it not making any sense was the exact reason why I never tried it. Who knows, maybe I'll bite and get it during the next dry spell. As for this game, I guess I'll wait for more details. Can't wait to see it! I've really enjoyed their past works! Here's hoping another great indie game joins the Wii U library and Nindie Family! World of Goo was great, think I bought it on 3 different systems if there was an app version (know I bought it on Wiiware and PC/Steam) but Little Inferno was too scary fate tempting raising two young boys in the house (I watched enough of Beavis and butthead in college). Will keep an eye out or this one. I'm guessing Wii U will get it since WoG and LI came our way. It's Little Inferno! Little Inferno just for meee... I've got a fireplace that burns at a hundred million degreeees, Little Inferno just for meee! Love that game! And I love World of Goo too! Brilliant editions and i'll have to invest in this if it comes to the wiiU! I was just thinking about World of Goo earlier today, and then this csme up. Spooky. @dizzy_boy ha me too, was thinking it's a shame I have to go in to Wii Mode to play it, how lazy am I?! Enjoyed Goo , but loved Little Inferno. Bought it at launch and have played it through a few times. Definitely didn't get burnt when I bought it. Sorry. Thoroughly enjoyed both World of Goo and Little Inferno, so I will check this one out as well as long as it comes to the right systems. I am incredibly happy about this. World of Goo is still one of my favorite games of all time and Little Inferno was basically a worthless game that they made into something great, so them making a legit gamey game sounds fantastic. I love both 2D Boy/Tomorrow Corporation games and I will continue to blindly support them. And yes, I realize the heavy irony in this statement. i will buy on day 1. thanks tomorrow corporation!!!! most under rated team in gaming. Little Inferno is a hidden gem on Wii U, such a wonderful and weird game. Owned World of Goo on Wii and Little Inferno on PC, I will be watching for this one. I'm gonna need this on the eShop, alongside an announcement for World of Goo HD with touch controls. Little Inferno was amazing, I'm sure this game will be too. Loved World of Goo and Little Inferno, so I'm really looking forward to this! YES YES YES YES YES YES YES YES YES YES!!! Exactly how long it takes to build a human, you say? Now I'm interested. Seriously though, World of Goo was fun but Little Inferno had an amazing (grim) atmosphere, I look forward to this. great news, loved world of goo, little inferno was ok, and the premise sounds promising. will keep an eye on it. come to wii u! Really hope this ends up on Wii U. Absolutely loved World of Goo and Little Inferno. Also just noticed, but the woman with glasses on the bottom right in the picture is definitely featured somewhere in Little Inferno. I loved both of 2D Boy/Tomorrow Corporation's games so this will be a day one purchase if its on the Wii U. Eeeeeeeeeeeeeeeeeeee!!! Can hardly contain my excitement! I love this developer. Their games ooze that special something more than just about anything else. Well they made a lot of money off Little Infero being a launch title. I think nearly everyone with a Wii U at launch must have bought that title. Hopefully they should regard the Wii U as a safe bet, even if the eShop is more crowded now than it was back then. Love their games! Will definitely be picking this up when it comes out! Little Inferno was amazing. I haven't played World of Goo, yet. Like many others here, I'll be keeping my eye out for this one. Will buy if on Nintendo console. Whatever it is, I must have it! World of Goo and Little Inferno are two of my favorite indie titles since indie became a thing so this is a day one purchase for me.